The new three-year contract offers enhanced job security to the two-dozen taxi and telephone operators who comprise the bargaining unit. Members will also receive a retroactive 10 percent wage adjustment in the first year of the agreement, along with wage increases of 2.5 percent in years two and three of the contract. The establishment of a reduced working week. ‘‘We are very happy with the new contract for transportation members at Taxis Coop Québec. 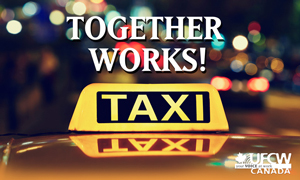 By winning better job security, wage gains, and other workplace improvements, the Taxis Coop members have built a better life for themselves,” says Daniel Nadeau, UFCW Canada Local 501 Director for Eastern Quebec. To read more about the new agreement for UFCW 501 members at Taxis Coop Québec, click here. UFCW Canada Local 501 represents over 19,000 members working in food retail and processing, manufacturing, and the technical and professional sectors at hundreds of companies across Quebec and northern New Brunswick. To learn more about UFCW 501 and its outstanding work, visit the Local Union’s website.